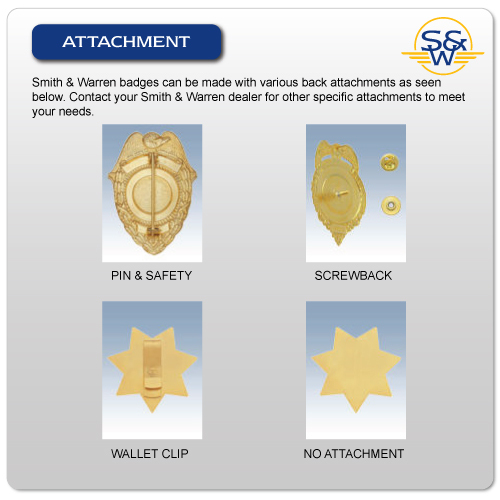 The attachment is on the back of the badge and it is an important part of your design. 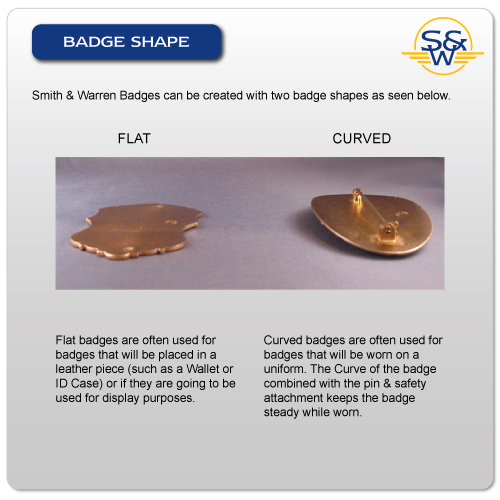 Pin & Safety catch are typically used for wearing the badge on a uniform shirt. Wallet clip should be used to put the badge in most leather badge accessories. Screw post is for the hat or is very useful when making plaques. The clutch attachment is used for nameplates and collar insignia. The clutch attachment can be seen on the picture with the screw post (at the top of that badge). Some badges come with solid back and some come with shell back. On some shell back badges, you can opt to fill the back of the badge in, making it a solid backed badge. Not all shell back badgescan be filled in solid. 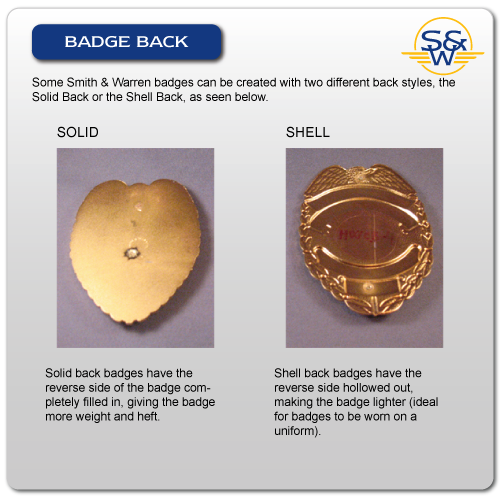 Shell back badges that can be upgraded to solid back will have a choice for the option on the design page. Should I have my badge made flat or curved? It depends on how you are going to wear your badge. Curved is most popular for wearing on a uniform and, is some cases, a leather accessory such as a universal belt clip holder. Flat is best used when you are putting your badge inside a custom-cut leather accessory. In that case, using a wallet clip and flat forming, the badge lies properly in the recess of the badge case. What is a text separator? Text separators are traditionally used on a circular paneled badge. They break up the circle into two distinct panels and are basically ornamental. You can choose stars or dots. How many words can I put on a badge? Can anyone buy a police badge? Badges with law enforcement TITLES (wording such as POLICE, SHERIFF, FEDERAL AGENT, FBI) are only sold to those in law enforcement. 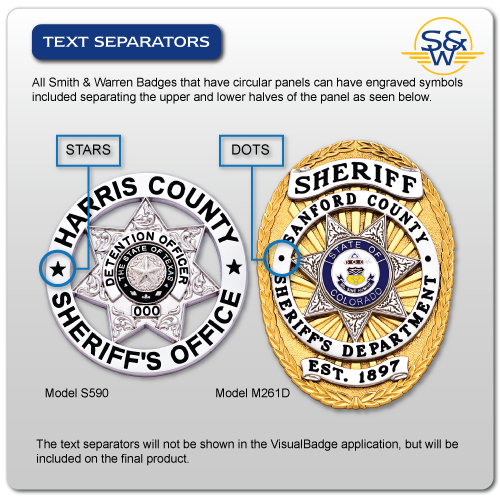 If you place an order for a law enforcement badge, you will be asked to provide a photo of your department credentials (ID) or a letter of authorization from your department. We do not sell law enforcement badges to collectors. Also, please see our ordering policies HERE. How long does a badge take to make? / Where's my badge? Generally badges take about 3 to 6 weeks to produce depending on several factors including the badge model and time of year. Custom badges are made from scratch and go through about 27 different production stations and quality control stops. Badges with premium finishes or custom center seals may take a little longer. You can see how badges are made HERE. How do you know what I am ordering? 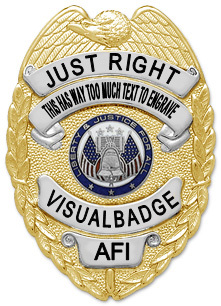 When you add your badge design to your cart, that information is sent to AFI just how you designed it. Once you've made your payment, that information is also sent to AFI. We will fill out an order form for you and email it back to you for confirmation, clarification or discuss any issues with you. So keep an eye out for the order form within less than 24 hours after you order. If you don't receive it, check your spam folder. Do you have wallets for my badge? Yes, we have a full ilne of custom-cut wallets, Badge/ID cases, belt clip holders, neck holders, etc. See our Leather section for your choices or select them from the VisualBadge design page. The pictures of the badge you see on the wallets and cases are for example only. All custom cases are cut to the badge you order.